Top 11 of '11 (iOS). Number 7 - Bug Princess. 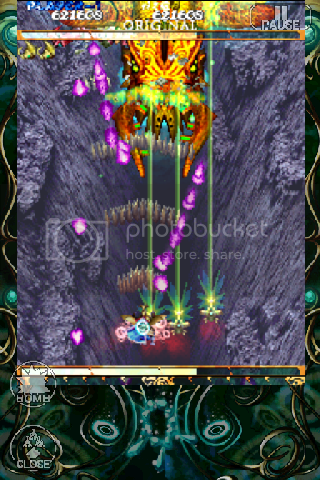 by PaulEMoz in "Bug Princess", "Cave", "Mushihime-sama", "bullet hell", "shmup"
I love a good shoot 'em up. Didn't I just say that? Oh well. One of the premier exponents of the shmup is Japanese company Cave, who have given us some of the craziest, most eye-wateringly difficult shooters of all-time. And yet, despite the difficulty levels, they remain fun and playable, which means that every new Cave release is awaited with some anticipation. Recently, Cave have turned their attentions toward the iPhone. It sounds ridiculous, even attempting to shoehorn arcade machines featuring a million bullets per minute onto a screen the size of a large stamp, but that's what they've done. What's more, they've done it with aplomb. 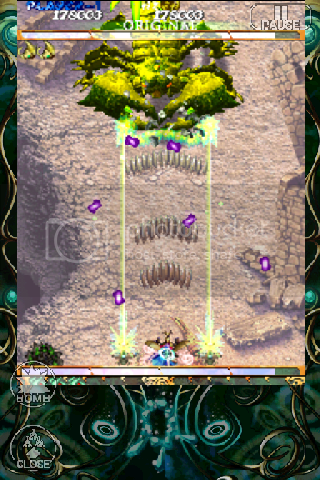 Bug Princess, which you might have expected to be called Mushihime-sama if you have any knowledge of Cave games, is their "latest" offering, although it's a conversion of an arcade game from 2004. Have any of you played it? I haven't, but I'd love to see a Cave arcade machine. Arcade shoot 'em ups have moved on a bit from when I were a lad. Back in the day, you were more likely to die from being rammed by an enemy craft, and you'd have done very well to score 200,000 points. Now, especially with Cave games, you'll die after being hit by bullets. That's guaranteed. However, when you die, you will very probably have many millions of points. That's a trade-off against the difficulty... at least you're rewarded for your pain. Hmmm. I normally like lobster. There's a bit of a story, but all you need to know is that you fly up the screen shooting bugs, insects, arachnids, arthropods... all manner of creepy-crawlies. And they in turn will shoot you. I'm not kidding. They'll spew out so many purple projectiles that you won't see right for hours after you've finished playing. Weaving a path through these is the main skill you'll need. The game shoots automatically on your behalf, leaving you to concentrate on squeezing through minute gaps. You'd think that might be a problem on a telephone, but it's a testament to Cave's designers that it's not just possible, but extremely do-able. In fact, I managed to 1CC the game on the Original mode... something I've never done on any other game like this. Don't buy this game if you can't bear to look at insects. Or purple. You might think that this game must be too easy, then, but the Original mode is just a prelude to the main game. Complete it, and you'll unlock Maniac mode, and then there's the Ultra mode to go for. These modes ramp things up considerably, being more difficult (obviously), but they also introduce new gameplay mechanics... chaining comes into play, giving you the chance to get much, much higher scores. 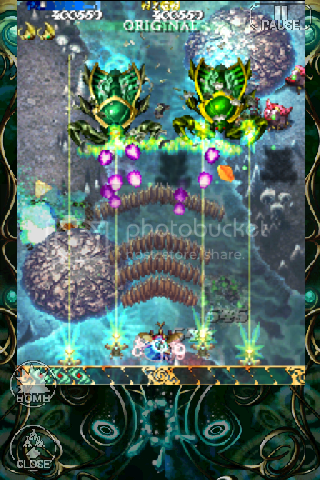 Bug Princess is an absolute joy to play. I find myself surprised to say that, but it's a true wonder of modern technology. Being able to successfully navigate streams of laser death using just your fingertip on such a small screen should be nigh-on impossible, but it's intuitive, straightforward and totally painless. If you have any lovefor arcade shoot 'em ups, you owe it to yourself to get this (if your iThing supports it)... with the varying difficulty levels, there's something for everyone. Bug Princess is £2.99 at the time of writing.